For 300 pages, I thought I knew the kind of book I was reading. Then Part One ended, and I realized I was reading something entirely different. You can’t trust this book at all—just when you think everything is settled and you know where it’s going, it swerves and leaves you with whiplash. I don’t like rollercoasters in my old age, all the jerking and whirling makes my inner ear go haywire, but I didn’t mind the way Sarah Waters flipped me and spun me through the pages of Fingersmith. She begins the story with Susan Trinder, an orphan kept from the worst of the streets of 19th century London by Mrs. Sucksby, a woman who operates an illegal baby farm in her home, tucked back in a dark corner of a slum. Sue keeps company with many a petty thief and criminal, so she’s game when a crooked man called Gentleman drops by with a devious plan and a role in it for Sue: he will woo a wealthy heiress, with Sue posing as the lady’s maid to grease the wheels, and after the marriage is final they will deposit the duped woman at the madhouse and her money into their own pockets. And then a bunch of other stuff happens that I won’t spoil for you here. This was my pick for book club this month, and while I’m a little worried some members of my group will be put off by the length of the book, I had lots of fun reading it and hope it goes over well. Last year I read The Paying Guests, which was my first time reading Waters, and I loved it so much I knew I had to dig into her backlist. For me, Fingersmith didn’t quite measure up to The Paying Guests, but maybe that’s just because the first cut is the deepest? I don’t know. It was still gorgeously written and surprising, and reading it only renewed my excitement to read more of Waters’ stuff. The hard part will be deciding which title to seek out first—I’ve had my eye on Affinity for a while, which centers around a women’s ward in a prison, and The Night Watch, which is apparently about a group of friends partying in 1940s London. Sounds like a good time to me! 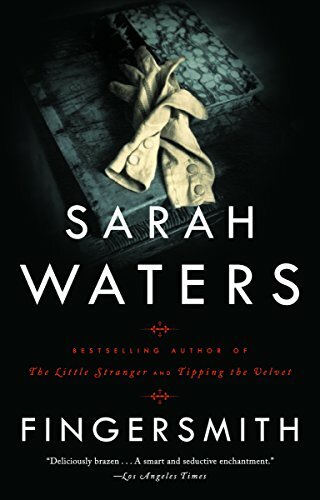 Now that I’ve read two of her books and become convinced of her consistent excellence, I’m left with only one question: How have I not read more Sarah Waters before now?! TagsAcross the Pond, Baby Mama Drama, Journey to the Past, LGBTQ, Living at the Funny Farm, Long Leisurely Reads, Mind Games, Sumptuously Gorgeous Prose, You Think You Know Someone, You Think Your Childhood Was Screwed Up?